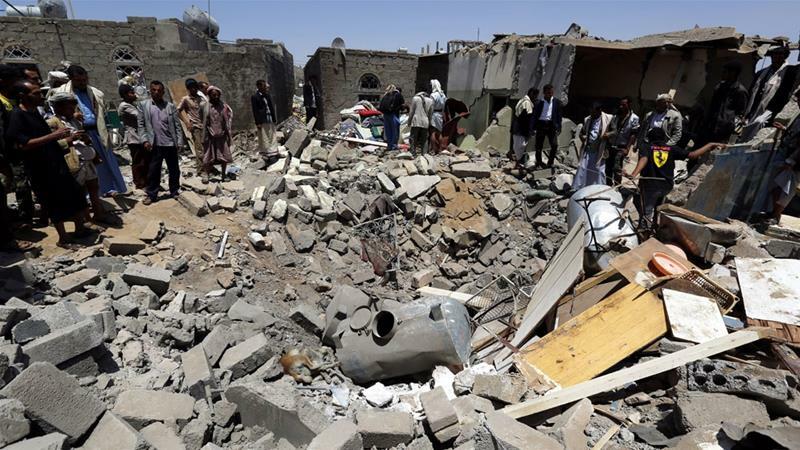 Many Yemeni officials and operations by the Saudi-led coalition , backed by the US, revealed unexpected information about the main goal of the peace talks which is considered as a push by the world body to end a devastating coalition war on Yemen. A military source at the Defense Ministry in Sanaa said that coalition is exploiting the political consultations to escalate its military operations in several fronts.“The enemy did not commit to any calm and continues to escalate militarily on internal fronts and at borders, and targets civil facilities, houses, and farms of citizens in a number of provinces,” the source said.Responding to the coalition escalation, the Yemeni army carried out several offensives against sites of the coalition paid fighters in several fronts in Jawf and Hodeidah provinces and caused heavy human losses to the paid fighters. In December 3,The Yemeni army spokesman Yahya Sarie said in a press conference that the coalition continued military escalation in all fronts and do not respond to ceasefire’s calls in Yemen, saying the coalition fighter jets have waged over 340 strikes on Saada, Hajjah, Hodeidah and other Yemeni provinces over the past ten days, killing and injuring dozens of civilians. A day later,he stated in a press conference that the coalition escalated ground and air attacks on Yemen ahead of the UN-sponsored peace talks in Sweden, adding that the coalition launched over 50 airstrikes and scores of ground attacks on the Yemeni territories over the past 24 hours.The attacks concentrated on Sanaa, Hodeidah, Marib and Saada provinces, and confirming that “The coalition’s attacks came simultaneously with the departure of our national delegation to Swede, which contradict with the United nations peace efforts,” . Furthermore, in December 5,he added that the coalition stepped up air and ground attacks on Yemen ahead of peace consultations sponsored by the United Nations in Sweden,revealing that the coalition launched over 69 airstrikes and dozens of ground attacks on Yemeni territories over the past 12 hours.The attacks concentrated on Jizan, Bayda, Hodeidah, Dhelea and Marib province.“The coalition’s attacks came simultaneously with the beginning of the UN-backed peace consultations in Sweden and that contradict with the peace efforts,” he said.He, however, said the Yemeni army repelled all the attacks, killing and injuring scores of the paid fighters, including Sudanese soldiers, stressing that the Yemeni army has the right to respond to any military escalation by the coalition. The United States will continue backing the coalitionon Yemen, says Secretary of State Mike Pompeo, despite a humanitarian crisis in the impoverished country and outrage over the kingdom in the wake of Jamal Khashoggi’s murder. “The program that we’re involved in today we intend to continue,” Pompeo said, speaking from a Group of 20 summit in Buenos Aires on Saturday. The Houthis’ arrival in Sweden followed two major confidence boosting measures — a prisoner swap deal and the transfer of 50 wounded Houthi fighters from Sana’a to Oman for treatment.